The other day while eating lunch I got a phone call from the Tsukuba Botanical Garden. Once again they had an injured bird that needed help. Though I imagined another owl, or perhaps even a hawk, when I asked them just exactly what kind of bird they were talking about, the man at the other end of the line answered- TSUBAME ( ツバメ)- a swallow! I first asked if they knew where the nest was, as I assumed he was talking about a chick. He said that he was not aware of any swallows nests within the botanical garden`s grounds. He then added that the bird they had found was not a baby, but an adult. Though swallows are far from rare and very difficult to care for ( or even keep alive) in captivity, I told him I would be right over. When I got there the bird was waiting for me at the reception office. It had been placed in a plastic box and was in a greatly weakened condition. The first thing I did was offer it some water with a straw. It swallowed some. 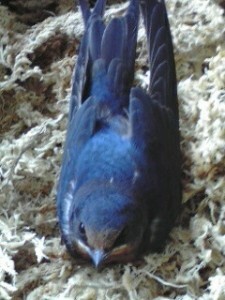 Since swallows engage in the act of catching and eating food ( mosty flying insects) ALL DAY LONG, I thought that I would have to start feeding it as soon as possible ( since I assumed it had not eaten in a long time). As mind mind raced trying to figure out how to provide the swallow with a sufficient and continuous supply of fresh bugs I realized, in a euraka-like flash of understanding, that the best place for rehabillitating this bird would be right at my own home, where in summer the garden teems with swarms of little winged creatures. Getting back home I placed the birds box just outside my front door. I then stood erect with my arms stretched out. Within seconds several mosquitos had landed on my shirt. In a flurry I beat my chest with open hands flattening a few of the pests to the cloth. I quickly plucked one and placed it at the end of a straw and offered it to the weakened and frighted bird. At first it hesitated, but then snatched the mosquito from out of the straw with its sharp beak. I repeated this every 15 minutes. By evening the bird had regained its energy and I realized, as it was trying to get out of the box, that one of its wings was badly injured. Still when I offered it mosquitos, moths or flies, it eagerly gobbled them up. I also realized that since swallows rarely descend to the ground and spend their non-flying moments perched on branches or wires that I should provide something more comfortable for the bird to cling onto than the strange mulch which had been provided by the botanical garden. The bird DID in fact seem to greatly enjoy the twigs I set up, and navigated back and forth with with plenty of zip. The next day the bird remained energetic and spirited and desperately tried to get out of the cage. I looked into its eyes and tried to imagine the places and scenes it has scene as these tiny birds migrate to Japan from as far away as Indonesia and Papua New Guinea! Of course, I WANT to set it free. But as it cannot fly, it would soon perish. I am sure, however, that kept in its small cage it will soon die anyway. That is where we stand today. Does anyone have any suggestions? Anyway, I am happy at last for my mosquito-ey garden to be put to good use. In a country where most people ( especially women) are highly sensitive to the presence of mosquitos and usually react with great panic when they detect them, visitors to my home in the summer ( and in autumn) are few and far between! I wandered on to your website while searching for information on the beiju celebration. I was wondering if there are any updates on your swallow. How noble of you to sacrifice your blood to the mosquitoes in exchange for food for the swallow! Hope you’ve been keeping well.